HUNTSVILLE, Ala. (BNC) by Peggy Champion, daughter — Flavil Hall Nichols, of Huntsville, AL, went to be with his Lord on April 28, 2018, while surrounded by family and friends. He had never received a speeding ticket. He never had a filling in a tooth. He was widely known not only for his stance on the Word of God, but for his tricks (we had a wreath display representing many of them at the funeral). 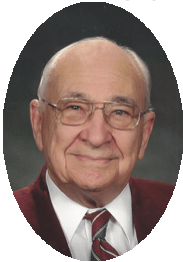 Mr. Nichols was a 1939 graduate of Freed-Hardeman College, Henderson, TN. He then returned for his third year for a special study of the Bible. Later he obtained further education from Florence State Teachers’ College (now UNA). He has made a life-long study of the Bible. He began preaching when he was fifteen years old. He did local pulpit work in Arkansas, Alabama, Tennessee, and Kentucky for 76 years. He also preached in many congregations and on lectureships in many other states and wrote many articles for brotherhood papers. Upon retirement from full-time preaching, he donated the majority of his personal library to the Gus Nichols Memorial Library (named for his father) at Faulkner University for on the campus in Montgomery, Alabama. He is preceded in death by his parents, Gus and Matilda (Brown) Nichols; wife of 64 years, Mary Elizabeth (Hardin) Nichols; and the following siblings: Gracie (Nichols) Young, Vodie (Nichols) Kerr, Carrie (Nichols) Hamilton, Foy Nichols, and Hudson Nichols. He is survived by two children: Jimmy Nichols (Houston, TX) and Peggy (Nichols) Champion and Don (Huntsville, AL); three grandchildren: Amy Bryan and Wes (Ardmore, TN), Brandon Champion (Huntsville, AL), and Christina Nichols (Katy, TX); three great-granddaughters: Kaylee Hall (Huntsville, AL), and Chelsea and Aubrey Bryan (Ardmore, TN); two siblings: Bertha (Nichols) Blackwood (Jasper, AL) and Hardeman Nichols and Virginia (Dallas, TX); and many cousins, nieces, and nephews. Mr. Nichols served on the Board of Directors of Childhaven in Cullman, AL and on the Board of Trustees at Faulkner University in Montgomery, AL. He was a member of Chase Park Church of Christ in Huntsville, AL, at the time of his death. He was buried at Walker Memory Gardens in Jasper, AL, next to his beloved Mary. Bro. Nichols was a very kind and helpful person. I met him at a FHU lectureship in the 1990s and was going through a difficult time in my first full-time work. He had never met me, but introduced himself, and spent some time helping me with my problems. I will never forget his kindness. point. I remember as a young preacher getting up in the pulpit at his request and reading the scripture as he commented on the various passages he had me to read. I honestly didn’t know when he was going to have me stop or keep on reading. There may be others of you out there that had that privilege. I also appreciate getting his advice on so many things. He volunteered to help me relocate somewhere if I ever wanted to leave where I was at the time. He and his good wife were great lovers of the truth! James S. Parker, evangelist at the Corinth church of Christ in Portland, TN. Brother Nichols had a memory unlike anyone I have ever met. He could remember days of meetings he had conducted and the subjects he spoke on. I loved talking with him. You got a history lesson each time.